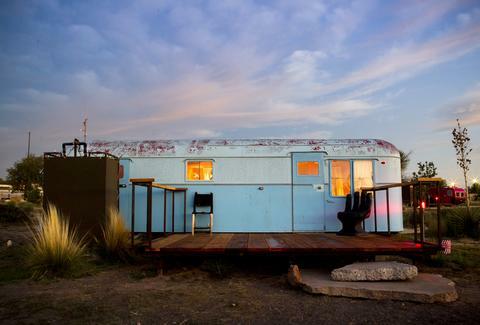 Not long ago, the thought of staying in a trailer evoked images of toothless, meth-addled men with shotguns, and pregnant women in Daisy Dukes -- a definite step down from a night at a lush hotel. 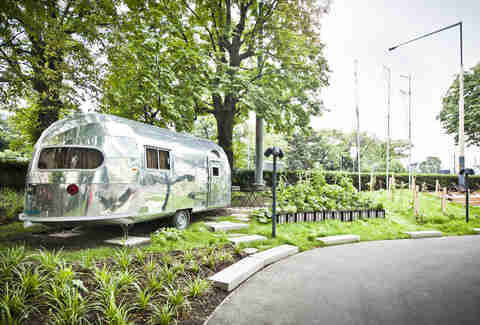 But today, hotels around the world are making happy campers by capitalizing on the retro-romantic idea of traversing the country in a shiny Airstream. 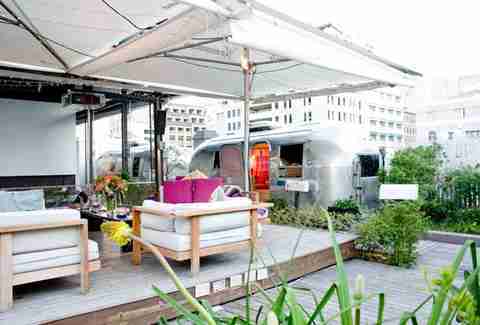 Check out some of the world's coolest mobile motels. 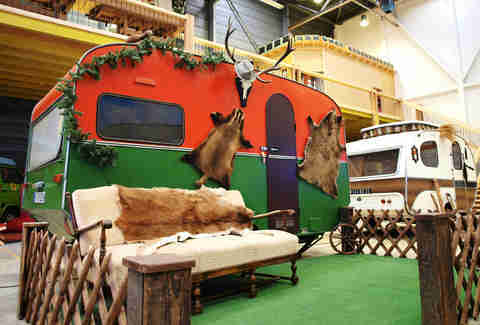 This indoor trailer park (it’s in an old warehouse) beckons with its super decked-out trailers -- 120 beds spread across 15 caravans, two night sleepers, two Airstreams, and various other automobiles. Each be-wheeled bedroom has a theme, including the fur-clad Hunter’s Hut and the bright pink Drag Queen, and each boasts its very own old tires and heroin needle-strewn furnished front lawn. 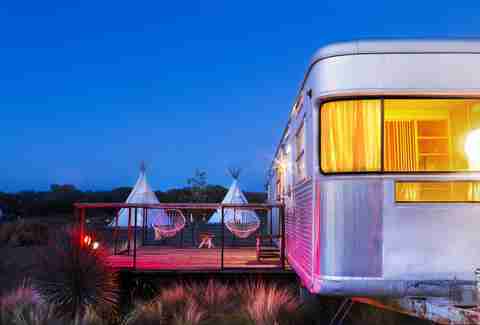 This hippie hangout -- or “18-acre nomadic hotel and campground” -- features seven ultra-cool restored trailers, as well as teepees, tents, and a hammock grove. Like Coachella minus the LA airheads, there’s also building, cooking, and art classes, songwriting workshops, movies, and concerts like the Trans-Pecos Festival of Music + Love to keep you entertained. This is some haute hippie ish, for real. Ok, so this hotel only has one trailer, but it might just be the most luxurious trailer in the world. 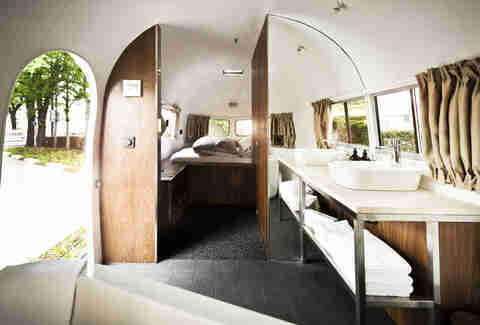 The 22ft-long 1952 Airstream offers 172sqft of minimalist luxe, and includes a queen-sized bed, free standing tub with a view, A/C, flat screen TV, and WiFi. 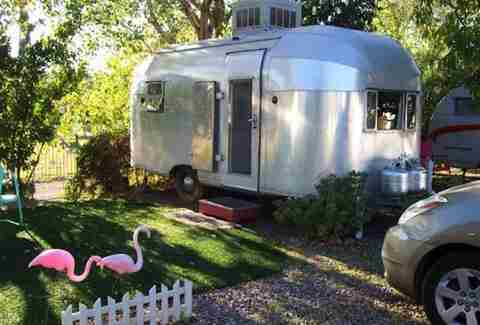 This trailer is basically way nicer than any apartment we'll ever live in. Possibly the only trailer park in the world with four stars, and definitely the only rooftop trailer park, this hotel houses seven Airstreams (each with its own mailbox) that were each designed by a different local artist, from the polka-dotted Dorothy to the mostly-bed Ballad of John & Yoko. The Moontides is the largest of lot, and fitted with a separate living and bedroom area -- more than we can say about most hotel rooms we've stayed in. 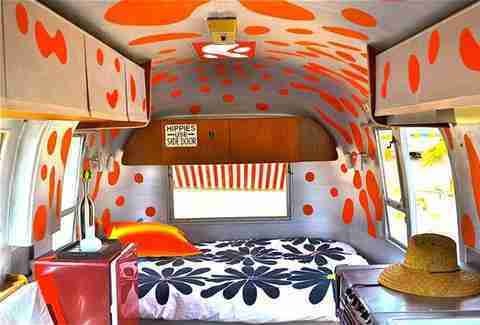 Kate, of B-52s fame, had artists Phillip Maberry and Scott Walker (whose house is featured in the "Love Shack" video) restore six vintage Airstreams into psychedelic, colorful homes with themes like Tiki and Hairstream. Slightly vertigo-inducing, but it's how we always imagined the inside of a lava lamp. Surrounded by the Grand Staircase, the Escalante Mountains, and Dixie National Forest, sit eight shiny, custom-designed Airstreams. Cowboy hopefuls should saddle on up to The Duke, a 31ft trailer John Wayne used on the set of The Searchers. 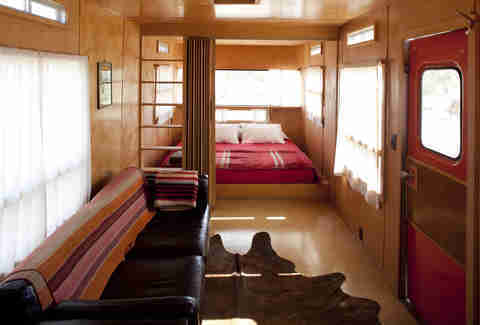 It's outfitted with Western décor, leather furniture, and pony fur. There’s also a drive-in movie theater onsite -- 1960s convertibles included. A cowboy motif always inspires us to chop wood, drink whiskey, and take our horseshoeing very seriously. 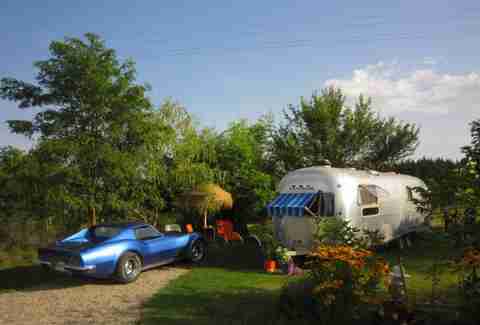 Owned by two former circus performers, this trailer park in southern France claims that it’s “not trailer trash, [it’s] trailer flash!" 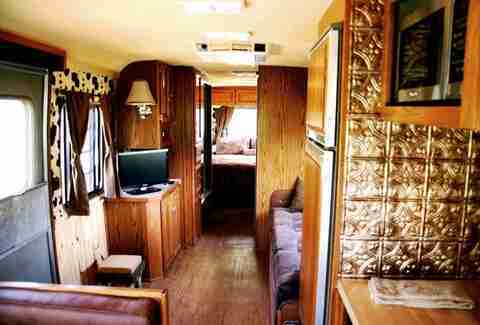 See for yourself; there’re 10 authentic Airstreams from the 1940s-1970s, each furnished in period-style themes including Studio 54 and Safari. 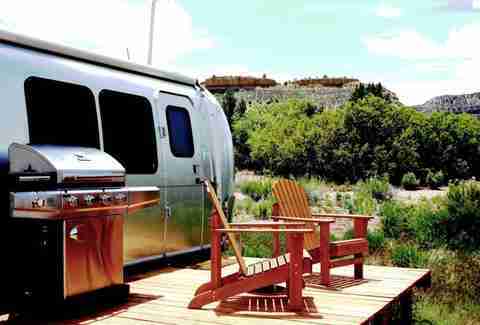 They feature kitchens and outdoor barbecues, and there's even an on-site bar -- in a converted Airstream, obvs. 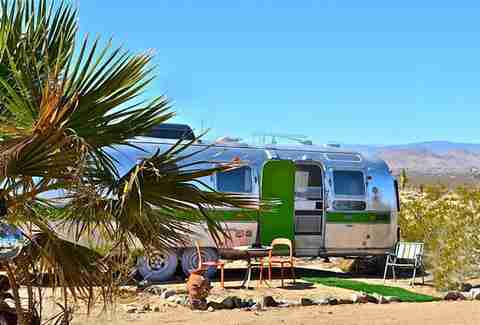 This place's nine vintage aluminum trailers with equally vintage décor (think phonographs and old-school radios) promise a blast from the past. You'll return to a simpler time, a better time, when men were men, drinking on the job was basically a requirement, and you returned home to crack a brew on your patch of astroturf.